Ciara! He Ain’t Your Baby Daddy!! 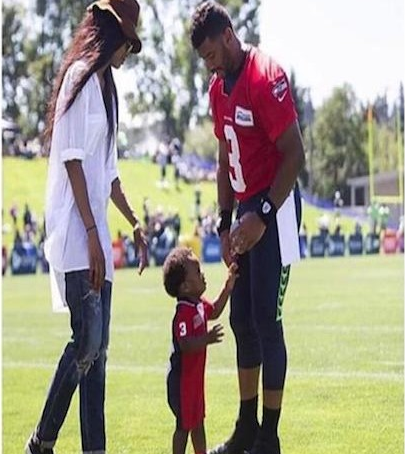 Over the weekend, pictures of Ciara, her son, baby Future and her boo thing, Seahawks player Russell Wilson surfaced all over the Internet. I actually thought that it was adorable to see them all together. However, I didn’t pay it much attention because I didn’t ever think it would end up being the topic of such a controversial discussion that not only us, regular folk would comment on but that celebrities would give their insight on as well. Aside from Future, Charlemagne gave him Donkey of the Day and both Lil Duval and T.I. took to social media to express their discontent with Ciara’s lifestyle choices. 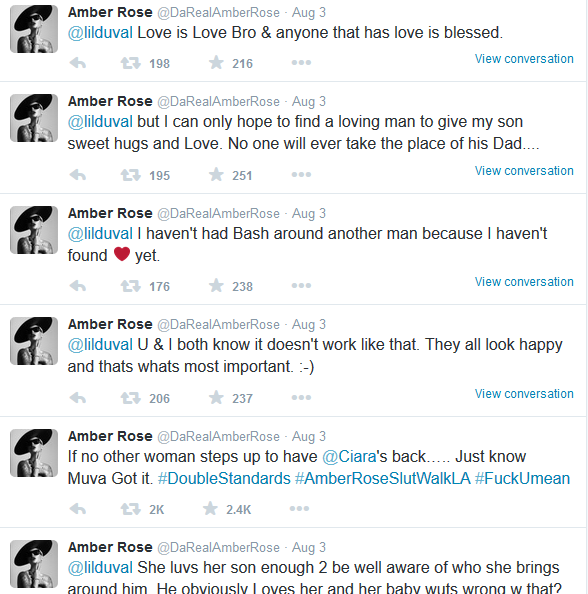 It was Lil Duval’s thoughts that actually triggered a response from Amber Rose: one of the supporters that came to Ciara’s defense in a twitter rant. As another mother whose relationship with the father of her child went south, she realizes the beauty of having a man willing to love you despite your surrounding circumstances. She knows that this could potentially be her if she is fortunate enough to find love in her near future. What is my take? I pretty much agree with Amber. Ciara is a 29 year old woman. Not that age has anything to do with it, but I say this to say that she is a grown woman. She has the right to make decisions and as it will not affect our lives, we have absolutely no say in what she does or will do. Whether it is right or wrong is something she should determine and if she later deems it wrong, she will take accountability for it. I give her the benefit of the doubt. Judging from several posts of her son, I see the genuine love she has for child and I believe she would do nothing to put her child in harm’s way. She is fortunate enough to have found a man who is understanding of her situation. There are some men out there who wouldn’t even entertain a simple conversation with someone who has a child from a previous relationship. At the end of the day, it is unfortunate that her relationship with Future didn’t work out but she was to move on eventually. Her role as a mother should not at all prevent her from finding love; the man she loves is going to be around her, and will thus be around her son. Had she not taken her relationship with Russell seriously, she would not even risk bringing him around baby Future. In the event that the relationship goes sour, Russell is a positive male figure, who if anything can be a positive influence in her son’s life. As long as they aren’t exposing him to any of their personal experiences as a couple, especially at 14 months, he probably won’t even know the difference between that man and any other of her male friends. Moving on…It honestly did surprise me to see T.I even comment. There are many examples of men who allow women to be around their children, and his life serves as the perfect example. Tiny had to accept his children from previous relationships as he did her daughter Zonnique. What makes that situation any different? 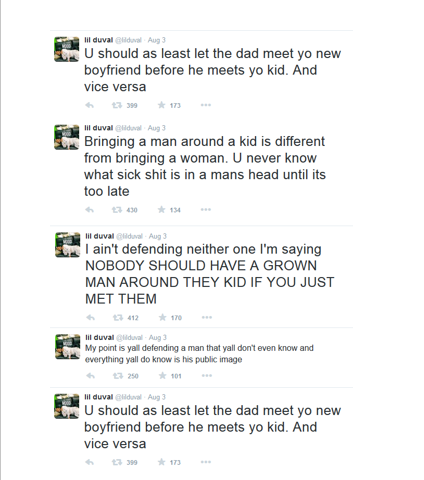 Is it that there is a belief that men have better judgment in terms of the people they allow to be around their kids? Why was it okay for him to have been around Zonnique? Men don’t magically find their true love on the first try. They, too, go through a journey before finding the one. His marriage with Tiny was nearly in jeopardy earlier this year so even that relationship nearly failed, and if it did, I doubt he was going to step away from the children he took in as his own. He would have continued to be in their lives as a male role model. Why can’t the same hold true for Russell? And back to Nayvadius( for those of you don’t know, that’s Papa Future) Future is not his only child, which means he has other “baby mothers.” Have they not moved on? I’m sure they are or will be in meaningful relationships with men that will interact with Future’s other children. It is inevitable. Why make it a big deal when it comes to Cici? A possible answer to this question (as well as the difference between this and Tip’s situation) may lie in the one point Duval made that I agree with: Ciara could have consulted with Future prior to having the baby meet Russell. Not that he would have been okay with the move, but he would have been aware of it. He could have taken initiative to feel out his ex-lady’s new man just to ensure that he was a good guy to have around that little Juicy Man (CiCi’s nickname for baby Future). Tension would have been eased and all this mess could have simply been avoided. Moral of the story: Ciara knows what’s best for both her and her child, but to avoid any further drama, she should probably start communicating more with Future.